The six-handicapper said he would be off scratch if it wasn’t for the other passion in his life, his family. “Before we had kids I used to hit a lot of balls,” he said. The proud dad loves his family but with three children under five it doesn’t allow any time to work on his short game. “These days I only hit balls when I play in competition,” Van Schyndel said. “On a good day I can play to scratch but you have to keep that consistency,” he said. The experienced golfer knows what it takes to succeed in the competition after finishing fourth in the national round of last year’s VW Scramble final. “I try to get the best out of them by directing them a little bit,” he said. 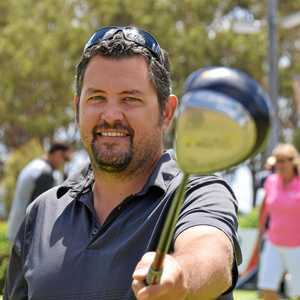 “Whoever wins today goes on to represent the club at the regional level of the competition at Pelican Waters Golf Club on the Sunshine Coast,” Oliphant said.